The last four edition of the SCBWI-BI Undiscovered Voices anthology are available to download for free! To download the latest edition (2018) please click here. We recommend reading the anthologies in the iBooks app on an iPad or as a non-converted pdf on Kindles, Kobos and other e-readers. 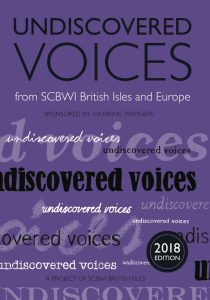 Download Undiscovered Voices 2018 Edition for free. Download Undiscovered Voices 2016 Edition for free. Buy a print-on-demand version of Undiscovered Voices 2016 Edition from Lulu (click here) from £5.99 (excl. VAT). Download Undiscovered Voices 2014 Edition for free. Buy a print-on-demand version of Undiscovered Voices 2014 Edition from Lulu (click here) from £5.99 (excl. VAT). Download Undiscovered Voices 2012 Edition for free.